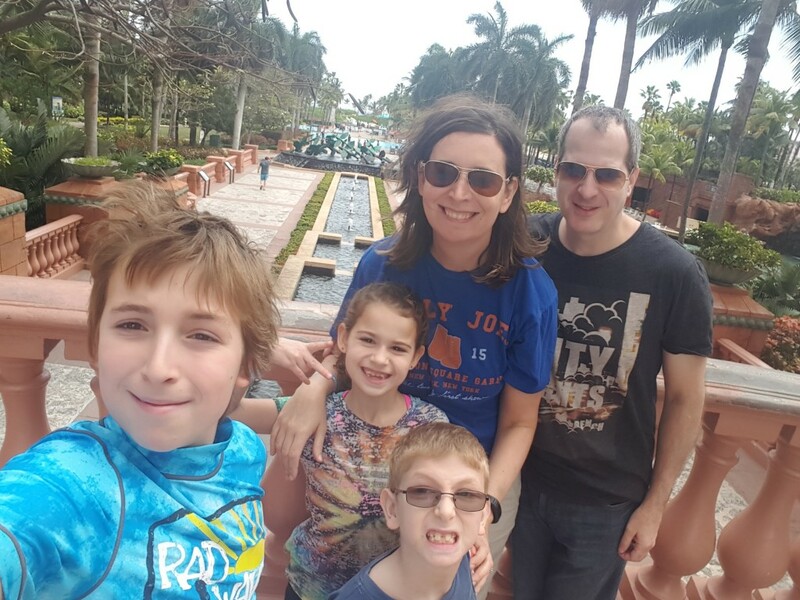 > Autism > Camera Lies: Why They’re Ok.
For five days in February, we traded a cold and snow for pools, beaches, palm trees and umbrella drinks in the Bahamas. It was the perfect spot for a mid-winter getaway. In a rare moment of weakness, I even posted a family selfie of the five of us living it up in tropical paradise (If I do post a vacation photo, it’s typically after we’re home. Call it unrealistic paranoia because it’s not like there’s anything worth stealing from our house). The kids did look adorable and we were someplace warm. But it was hardly the fun day the picture portrayed. This photo is one of many that proves that the camera does lie and social media is a perfect place to perpetuate such falsities. That day started off great. We were headed to the pool after a delicious breakfast buffet. Everyone was happy, relaxed and excited when we shot the selfie. Oh, and it happened to be my birthday, too. Unfortunately, that day quickly went from good to bad to worse. Nothing too horrible except that Evan and I almost drown in a not-so-lazy river ride (but more on that later). It was also then that we discovered Evan’s utter disdain for girls with pig tails in their hair. Honestly, I can’t blame him. Very few can rock them. But, the way he handled it was humiliating to the rest of us and embarrassing to the girl who had them. “You look ugly,” he loudly told a bikini-clad girl no older than 7. This resort had nearly a dozen waterslides, more pools than we could count, beaches and river rides (like the one that almost killed us). With three kids – all with their own idea of what pool or slide we had to go on -, everyone was fighting, whining and uttering “not fair.” Compromising was out of the question because at this point each sibling had the ultimate goal of making sure the other didn’t get his or her way. Nobody cared that we were at a place made Disney look cheap or that we had five days to do nothing but ride all the slides we wanted and swim until we were hungry and then swim some more. Later that afternoon, Evan and I were riding the not-so-lazy river in a double tube. It was probably our sixth time on the mile-long river ride. After gently colliding with another tube upon entering the rapids part of the river, we flipped over. The water was no more than four-feet deep, but the current was strong, powered by “master blaster technology,” according to the website. It was hard to stand in the currents and even harder to stand while holding a terrified 10-year-old. Evan and I are both good swimmers and I never even thought to have him wear a lifejacket. Ultimately, I was able to grab on to the wall while clutching my son, and fortunately we happened to be standing in front of a lifeguard station where two guards stood on watch. Unfortunately, it took a few minutes to convince the guards we needed help. Finally one jumped in and got Evan, allowing me to grab and climb into my own tube. I’m still waiting for the aquatics supervisor to call and explain why the guards didn’t respond quicker. They said they were investigating. Again, nothing tragic about our rough day– except two nicely scraped elbows and a bruised knee – but definitely not the best way to enjoy the Bahamas. To top things off, as we were leaving our condo for my birthday dinner, Noah turned green and said he didn’t feel well. So much for the dinner reservation we had to make four months in advance. So do I feel like a big fat liar for posting the photo on Facebook after such a difficult day in paradise? The day was pretty bad, as far as bad days go. The rest of the trip had its challenges as well, but looking back on our vacation, I can honestly say I rememberthe happy times. I think about all the laughing we did together and the fun we had as a family. I think about the fact that each one of us overcame a fear by going on various water slides – except my courageous husband, who was only afraid of how many kids peed in the pools. The bad moments of the trip don’t stick out in our minds. Like childbirth, we don’t remember the pain. This vacation wasn’t as picture perfect as the photo suggests, but our memories of the trip are. Thanks Susan. Loved what you said about “at that moment…” Perfect. If there’s a smiling picture, that’s already a good sign! We love this place too but hate the rapids ride, never going on it again after a few bad experiences.